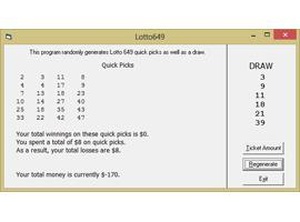 Lotto 649 Simulator simulates the results of financial difference when comparing the cost of buying Lotto 649 tickets with the odds of winning. I like running the program and holding ALT+R. It reminds me why I do not play lottery games.